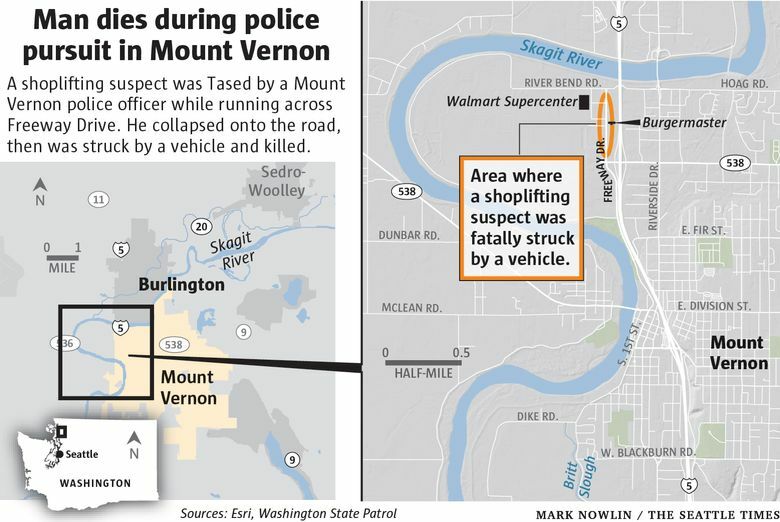 Skagit County investigators are looking into the death of a shoplifting suspect who was fatally struck by a vehicle Wednesday night after being Tased by Mount Vernon police. Mount Vernon officers had been called out to a report of a male shoplifter running away from Walmart on Freeway Drive, which runs parallel to Interstate 5, at about 8:30 p.m., according to Heather Axtman, a spokeswoman for the State Patrol. A witness said that the suspect had been seen near Burgermaster, described the suspect’s clothing and said he was carrying a plastic bag, police said in a news statement released early Thursday. The first officer to arrive saw a man a short distance from the restaurant who matched the description of the suspect. As the officer attempted to contact the suspect, he fled and the officer followed, Axtman said. As the man started to run across Freeway Drive, the officer Tased him, causing the man to drop to the ground, where he was hit and killed by a vehicle that was headed south on Freeway Drive. The Skagit Multiple Agency Response Team, which is composed of multiple detectives from several Skagit County police agencies, was asked by Mount Vernon police to investigate. Police provided no further information about the deceased man.